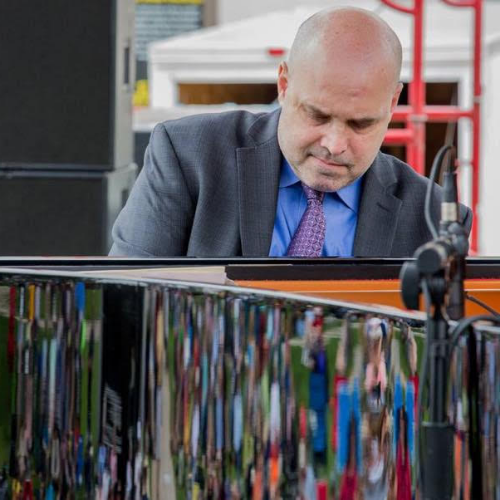 Originally from Toledo, Ohio and now based in New York City, Larry Fuller is an internationally acclaimed jazz pianist, band leader, and clinician who is known by critics and fans to "swing like a beast!”. Early in his career, Fuller’s undeniable talent earned him the position of musical director and pianist for GRAMMY-nominated vocalist Ernestine Anderson, pianist for renowned drummer Jeff Hamilton’s Trio, and final pianist in legendary bassist Ray Brown’s Trio. Fuller also toured with guitar-vocal giant John Pizzarelli. Since 2013 - harnessing his extraordinary experience - Fuller has led the Larry Fuller Trio. He presents a musical program rarely experienced live today, consistently praised for his emotive, swinging style, monster technique, and program versatility. From bop, to stride, to swing, to blues - Fuller’s show at Kerrytown Concert House is one you will not want to miss! George DeLancey is a Cambridge, OH native and alum of the prestigious Columbus Youth Jazz Orchestra and the Michigan State University Jazz Studies Program, where he studied under Rodney Whitaker. He has worked with notable bandleaders Wessell Anderson, Larry Fuller, Tia Fuller, Philip and Winard Harper, Christian Howes, Willie Jones III, Wynton Marsalis, Cécile McLorin Salvant, Johnny O'Neal, Ben Paterson, Houston Person, Bria Skonberg, and many others. George is active nationally as a bandleader and educator for programs including Jazz at Lincoln Center’s Jazz for Young People, Christian Howes’ Creative Strings Workshop, and Keith Hall's Summer Drum Intensive. He is the director of the Midwestern arts initiative Appalachian Muse. George’s self-titled debut recording was released in 2016 to critical acclaim. Jason Tiemann is a New York City based jazz drummer and educator. Drawing influence from the great(s) Philly Joe Jones, Tony Williams, Elvin Jones and Billy Higgins, Tiemann is quickly forging his musical voice on the New York scene by fusing his depth of historical foundation with crisp technique and propulsive, intuitive swing. Before moving to NYC, Tiemann was Professor of Jazz Drums and Percussion at University of Louisville for 12 years. He was also active on the Midwest Jazz circuit, in constant demand throughout the region as an educator and performer accompanying numerous jazz luminaries. Since 1998, Tiemann has been an artist/clinician for the Jamey Aebersold Summer Jazz Workshop. Tiemann has performed and/or recorded with an astonishing array of musicians including Benny Golson, David Liebman, Harold Mabern, Eric Alexander, Mike LeDonne, Peter Bernstein, Slide Hampton and countless others. He is an endorsing artist for Yamaha drums, Evans drumheads, and Innovative Percussion sticks, mallets and brushes.